Science means business. Should it mean jobs too? As the largest action by trade unions gets underway today, spare a thought for the scientists. As @professor_dave told PST on Twitter this morning, most scientists at York University are “definitely not” unionised. Indeed, according to German researcher Professor Thomas Rose, science has been pushed to the sidelines in the UK trade union movement. Should science be on the agenda of the trade unions? But look at where the money is going and you’ll see a very commercial slant. As David Willetts said yesterday, the new money “underpins important industrial sectors and will unlock private investment in new products and services, driving growth and creating high-tech, highly skilled jobs”. The government is clearly more concerned with industry than the individuals in lab coats doing the actual work (see how Willetts literally puts “private investment” before “jobs”). So what of the trade unions in all of this? 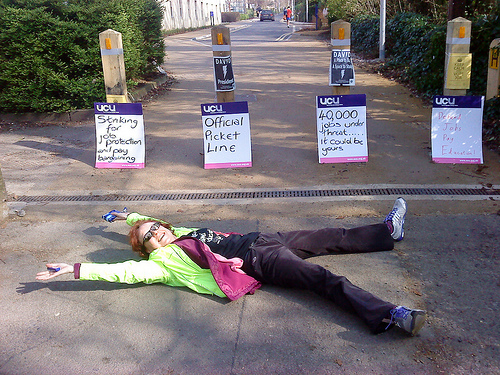 Well, according to Rose, who is knee-deep in a unique study of the attitude of trade unions to science, they are almost non-existent these days, compared to, for example, the unions’ major role in establishing Ruskin College in 1899. Rose delivered some preliminary results of his research in a talk on Monday night at UCL. 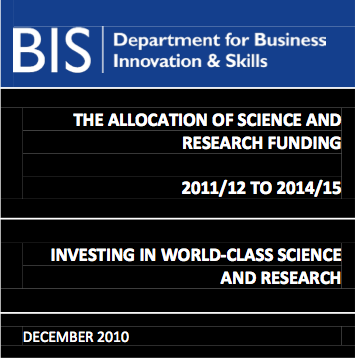 BIS report: "no mention of trade unions"
One could certainly draw that conclusion from the chancellor’s recent announcements on science – commercialise this new wonder material, build more stuff for that new project, and so on. That said, new money always helps scientists to do more. And perhaps one shouldn’t look a gift horse in the mouth. But it might be useful to consider for one moment what might happen if the UK continues to concentrate its science where the money is, rather than on massaging the brains behind the science itself. Scientists grasp all too well the importance of science – not just to the economy but also, well, just because. That the trade unions are dodging this, according to Rose, and scientists are not unionising themselves, might inspire some serious navel-gazing today. On the other hand, another researcher pointed out on Twitter this morning that he has enough problems with EPSRC and policy without “unions muddying water too”. Top image courtesy of Yewtree. First comment. “Should it mean jobs too?” My instant reaction is, yes of course it should. Too much economic activity today considers what is best for economic activity. There’s no sense that it should be a servant of popular interests rather than a master. Not particularly surprising I suppose, and if that makes me sound like an old-fashioned leftie then I guess that’s what I’ll have to be. However, I’m also a working scientist and a trade union member. Prospect is a union that represents scientists and engineers in both the public and private sectors and I’d like to suggest that it certainly isn’t dodging the issue of the importance of science to the economy. It is actively involved in promoting the value of science, not just for its own sake, but as an economic benefit to the country. By promoting this value, it is also then pursuing the more traditional trade union interest of working to promote the jobs and working conditions of its members. The two go completely together. I’d caution any working scientist that trade unions muddy the waters around funding and policy, as suggested at the end of this piece. Funding bodies such as the EPSRC have their agenda heavily determined by government policy. Unions such as Prospect can bring together opinions and evidence from across a broad spectrum of science to help to oppose the worst of short-term, quick-fix-ism which we increasingly see being imposed on funding decisions. Thanks for the thoughts, Phil. Prospect is doing good work in this area, as you outline. But I think we have a long way to go before scientists are as unionised as, say, the rail sector. I can’t help but wonder why that is. Is it connected to the sector’s (perceived?) insularity? Are scientists just not that political? So long as they have a lab, they can disengage from the political decisions taken that part-control that lab? Thinking about it a little more, it’s not that an individual scientist is not political. Most of them are – they are naturally critical thinkers and have passions and moral codes. But it’s just that as a group, they come together to talk about science rather than politics. The funding ring-fence (cuts) last year did bring them together, through reactive groups like Science is Vital. Does this mean that they come together when threatened but otherwise just want to go on with their research? I think your last sentence gets to one of the key points. Yes, scientists are to some extent selfish people. They have these ideas and want to get on with them. I guess there are several motivating factors in action – good old intellectual curiosity, acclaim from one’s peers. Probably not financial advantage if you’re working in academia or the public sector. There’s a factor coming increasingly into play though, namely the need for demonstration of impact and public engagement in grant applications. I wonder of there’s something here that can be used to help scientists think a bit more collectively? With the increasing tendency towards large consortia in grant proposals, you have to start thinking as part of a group right from the start. If your community of scientists is so important and doing stuff that you have just demonstrated to be vital, why not get together with other scientists to defend your other interests? Maybe this is an angle that the unions should be picking up on? Good thoughts, Phil. Are you aware of groups that work collectively right from the start in making their grant applications, perhaps from your own experience? This might be something we could look into more here on Purse String Theory – especially the extent to which scientists are being ‘forced’ to club together, and whether or not this is a good thing. In addition to joining forces to win money, does ‘other interests’ include moving science up the political agenda and thinking about employment rights of researchers and that sort of thing? Not quite sure what you’re classing as ‘other interests’.